In the NASUWT’s annual Big Question survey of teacher opinions, pupil indiscipline now ranks in the top three of teachers’ concerns about their job. Increasing class sizes, the narrowing of the curriculum, lack of access to internal and external specialist support and advice and the increasing number of pupils with special needs in mainstream classrooms are amongst the day-to-day realities faced by teachers and some of the main contributory factors to the pupil indiscipline problems teachers increasingly face. 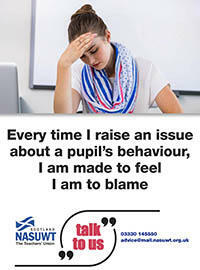 Teachers who raise concerns too often find that they are blamed for the indiscipline or told that it is ‘part of the job.’ Being told it is part of the job is a particularly common experience for teachers who work in special school or pupil referral units. Every teacher has a right to work in an environment free from violence and disruption, regardless of the setting in which they work. The NASUWT has a record second-to-none in supporting teachers in tackling pupil indiscipline and ensuring they are provided with a safe working environment. Posters which can be displayed on notice boards can be downloaded from the expandable panels on the right/below depending on which device you are using. Whatever the concerns you and the members in your workplace are facing on performance management, pupil indiscipline or any other issue, please talk to us and let us help and support you. Unchallenged, low-level disruption is corrosive, taking its toll on the health and wellbeing of teachers. The education of all pupils is affected. Hundreds of teaching hours can be lost each year dealing with such behaviour. However, wherever violence and disruption occur, they must be challenged. No teacher should go to work with the expectation that verbal and physical abuse are part of the job. The NASUWT has a record second to none of supporting teachers where problems arise with pupil indiscipline. regular monitoring and review of data on pupil behaviour to ensure that the behaviour policy is working effectively. - Report the incident in accordance with the school's behaviour policy. 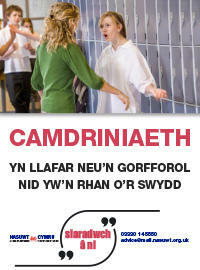 - Make sure the incident is entered into the school's accident/incident book. - Keep a copy of any written report that you make. 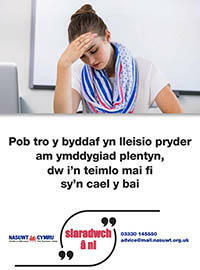 - Seek advice and support from the NASUWT as soon as possible. 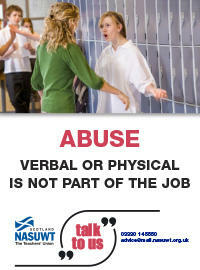 -Keep a record of the incidents, including screenshots of any abusive or offensive material, to be used as evidence. advice and guidance on behaviour management, including top tips for teachers on maintaining high standards for pupil behaviour. 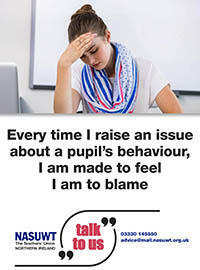 in-school support - the NASUWT will arrange to meet with members, in their workplace or off-site, to discuss any concerns they have either on an individual or collective basis and identify strategies for dealing with any issues of pupil indiscipline members may be experiencing. Where schools fail to address teachers' concerns, the NASUWT with the support of members, will ballot for members to refuse to teach and supervise the pupil(s) concerned, in order to protect members' health and welfare.